The amount of data stored in Datagraph-med is way to much to fit on one spreadsheet. So in table view you will have to make a selection of fields to be displayed by clicking on the 'Fields' icon in the table view's ribbon bar. Datagraph-med comes with a default selection, but you can select columns of your choice or hide fields which you do not need. Fields which have a check mark in the 'show' box will be part of the data entry table. There are 4 field groups from where you can make selections: 'patient data', 'treatment data', 'follow up data' and wavefront ('aberrations') data. 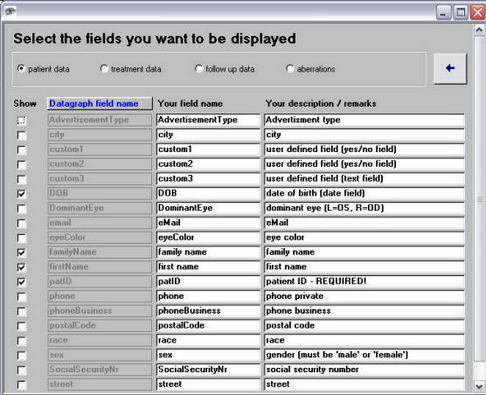 Note: You can change field names which are displayed on top of the columns in the table by typing a different name into the 'your field name' area of the filed selection window. Sorting on any of the 4 columns in the field selection window is possible by clicking on the column label.